As Apprising Ministries covers issues within the visible church, while a tsunami of apostasy approaches, I’ve told you that evangelicalism made a horrible mistake when it embraced the sinfully ecumenical neo-liberal cult of the Emerging Church—a veritable Trojan Horse full of heresy—headed by, among others, the unholy Emergent Church trinity of apostates, Living Spiritual Teacher and EC guru Brian McLaren, universalist Emerging Church pastor Doug Pagitt, and his friend Tony Jones, the progressive “theologian in residence” at Solomon’s Porch. However, it’s also important you understand that among the corrupt theologians greatly influencing this spiritually motley crew in the upgraded Emering Church 2.0 is uber-liberal theologian Harvey Cox, who’s also very instrumental in assisting progressive Christian theologian Philip Clayton. Together they, and others of like darkened mind, continue cobbling together this new postmodern form of “big tent” Progressive Christianity—a Liberalism 2.0—sometimes referred to by these rebels against the final authority of God’s Word as Emergence Christianity. why doesn’t Brian want me to know and believe the truth about Jesus? He says that his new kind of Christianity is led by Doug Pagitt, who isn’t sure that Jesus is God; Marcus Borg, who argues that Jesus is dead; and Harvey Cox, a Harvard Divinity professor who wants to blow the whole thing up and construct a new view of God that will connect with our secular age. Brian says that Cox’s new book, The Future of Faith, divides church history into the Age of Faith (pre-Constantine), the Age of Belief (from Constantine until today), and the Age of the Spirit (yeah! That’s us!). This tripartite division of history sounds similar to the system taught by Joachim of Fiore (a medieval Jack Van Impe), except that Joachim said that the Age of the Spirit would climax around 1260 (about 700 years before Jack’s first miss). The benefit for Brian is that Cox’s model enables him to dismiss everything from Constantine until now—ecumenical creeds, councils, Augustine, Anselm, Aquinas, Luther, Calvin, Edwards, and Piper—as belonging to an imperialistic Age of Belief when doctrine was used to “burn and banish heretics.” We now live in the fresh air of the Spirit, who frees us from our confining and mean-spirited, doctrinaire past. Harvey Cox is the most important liberal theologian of the last half century because he could see around corners…. The Future of Faith is, quite simply, a beautiful book and a Cox classic. This important book has not only helped me understand the past, present, future of this amazing phenomenon called Christianity . . . it has also motivated me to keep working to help make actual the possible future Cox envisions. The Future of Faith is a tour de force. As passionate and challenging as his classic, The Secular City, Cox’s new book invites the faithful, the skeptical, and the fearful into a spirit-filled version of Christianity that can renew a hurting world. 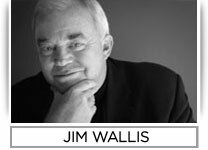 There are too many bending over backward trying to give Wallis a pass when he claims to be a “progressive evangelical”; but we’d need to pack our bags and head deep into the postmodern Wonderland of Humpty Dumpty language to believe that an actual evangelical would say, “The Future of Faith is an essential guide to” the “future” of this “new global Christianity.” The truth is, it’s not Christianity at all; but rather, a global religion that even a pantheist proponent of New Spirituality aka New Age like Deepak Chopra can sign onto—progressive, you betcha; evangelical, not in any real sense, which you’ll come to see below. The disciplines of prayer, silence, and contemplation as practiced by the monastics and mystics are precisely that—stopping the noise, slowing down, and becoming still so that God can break through all our activity and noise to speak to us. Prayer serves to put all parts of our lives in God’s presence, reminding us how holy our humanity really is. There’s nothing enlightened about shrinking so that people won’t feel insecure around you. We are all meant to shine, as children do. We were born to make manifest the glory of God that is within us. It’s not just some of us; it’s in everyone. And, as we let our own light shine, we unconsciously give other people permission to do the same. And as we’re liberated from our own fear, our presence automatically liberates others. I cannot count the number of times I’ve been faced with mistranslations or misunderstandings of Jesus’ words [N.T.] Wright refers to, “My kingdom is not of this world.” That statement has been used to justify every manner of withdrawal from the world of politics and, often transparently, a Christian acceptance of the political status quo. Of course, Jesus’ kingdom is not “of” this world, in the sense of being “from” this world, as Wright says. Jesus’ kingdom is not like the other kingdoms of the world, and that’s the point. Jesus proclaimed in the Gospel of Matthew, “Repent, for the kingdom of heaven is at hand.” The word he used was metanoia, which in the Greek literally means transformation, from the root of the word metamorphosis. He is saying that a whole new order is about to enter history and, if you want to be part of it, you will need a change so fundamental that the Gospel of John would later refer to it as a new birth. Being born again was not meant to be a private religious experience that is hard to communicate to others, but rather the prerequisite for joining a new and very public movement—the Jesus and kingdom of God movement.” It is an invitation to a whole new form and way of living, a transformation as radical as a caterpillar becoming a butterfly. It is far more than a call to a new inner life, or a rescue operation for heaven. So you see, Wallis believes a different gospel; one which is the same as Katharine Jefferts Schori, the progressive/liberal Jezebel who heads the Episcopal Church, which I discussed in Katharine Jefferts Schori Calls Individual Salvation Heresy/Idolatry. My opening text above sheds additional light here that we’re not preaching the same Gospel, which is individual repentance and forgiveness of sins in Jesus’ Name. That God the Holy Spirit is showing us in this text that a given individual must respond to the Gospel couldn’t be clearer as He inspires His Apostle John to include this private conversation between Nicodemus, a ruler of the Jews, and Jesus. Jesus was not on the same level with Nicodemus. He is “from above” (anothen; v.31), therefore Nicodemus must be born “from above” (v.3, NIV marg. anothen). To be born again or born “from above” ( anothen has both meanings; e.g., “from above” in 19:11 and Gal. 4:9) is to have a spiritual transformation which takes a person out of king of darkness into the kingdom of God (cf. Col. 1:13). The kingdom is the sphere or realm of God’s authority and blessing which is now invisible but will be manifested on (Matt. 6:10). Jim Wallis, The Great Awakening: Seven Ways To Change The World [New York: Harper Collins, 2008], 290, emphasis mine. Marianne Williamson, A Return to Love: Reflections on the Principles of “A Course in Miracles” [New York: HarperCollins Publishers, 1992], 190, 191, emphasis mine. John F. Walvoord and Roy B. Zuck, eds. The Bible Knowledge Commentary, 2 Vols [Colorado Springs: Cook Communications Ministries, 2000] , 281.